Busy enough to forgot charging your laptop? Well now you can charge it inside your car. You can watch movies, tv series and do your documents without hassle and worries about your battery. 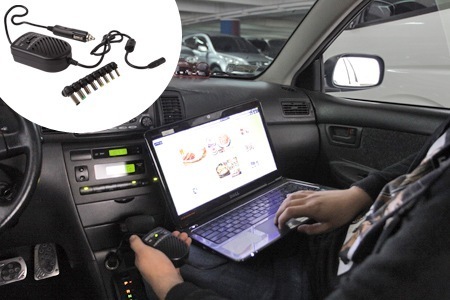 This Universal Car laptop charger has 8 different connectors that are compatible with the usual laptops and netbooks we have like HP, Compaq, Dell, Acer, Sony, IBM, Lenovo and others. You can now charge and enjoy your gadget even while inside the car or driving. Mobile computing will now be possible as long as the laptop is plugged into the car's electro-hole. This means that I can also blog and write articles while on travel, great!